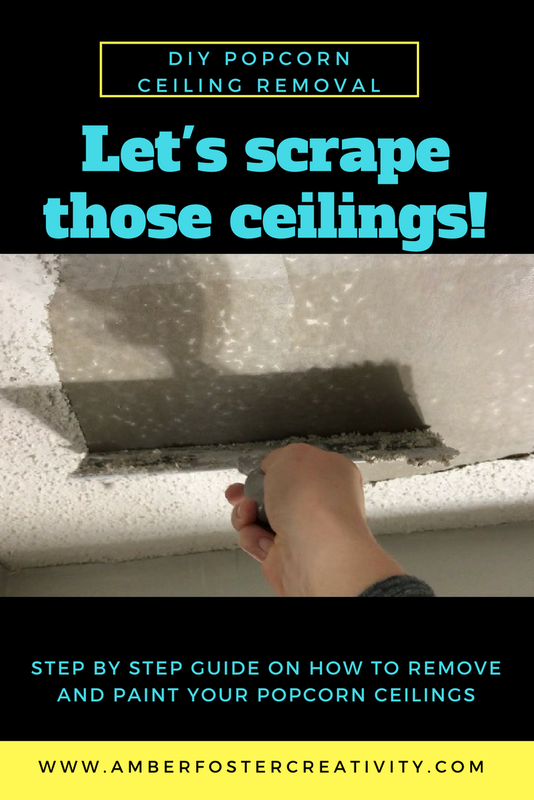 Time to get rid of those dirty, dingy outdated popcorn ceilings, because like I always say, popcorn belongs in your belly not on your ceiling. 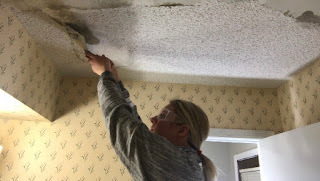 First, things first, make sure you have your ceiling in your home tested for asbestos BEFORE you begin this project. Exposure to asbestos is extremely harmful. Next, you want to be sure to cover EVERYTHING with plastic. Don't skimp on this step or you will be sorry later. Imagine your toddler children having a mud fight in whatever room your in. That's whats about to happen, so prepare accordingly. 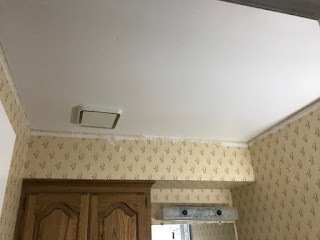 Remove or tape off any fixtures. Turn off power is a power fixture is present, because you will be spraying water all over the ceiling. Third, take a pump sprayer and spray down a small section of the ceiling with hot water. Let in soak in a minute or so, then spray it again. You then can begin using a metal or plastic scraper to start scraping away the popcorn. Be sure to wear eye protection. It will get in your eyes if you don't. 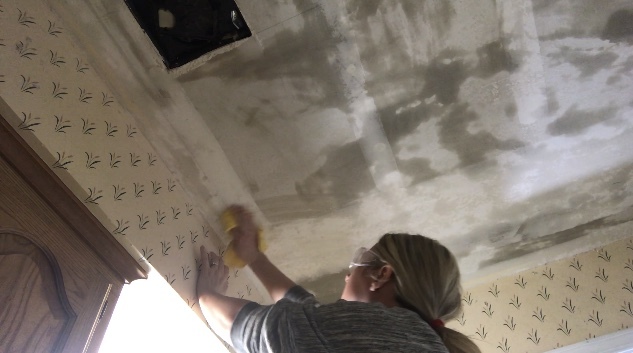 After you have wet and scraped each section of the ceiling go back over it wiping it down clean with a wet rag or a mop. You want to be sure and remove as much of the remaining dust as possible. Paint won't stick to dust. Now, you may notice a few imperfections in the ceiling. You can use sheet rock repair to smooth these out with a little scraper tool. You can sand when dry if necessary, but I have yet to find that necessary. Allow the ceiling to dry completely. It usually dries pretty quickly, maybe 30 minutes time and then you are ready to start priming. Priming is absolutely necessary. The paint itself will not adhere well directly to the sheet rock. If you aren't going to also be painting the walls you may want to tape them off or go around with a brush first. I will be repainting these walls so I'm just rolling it on. Allow your primer to dry completely and then you are ready to apply the ceiling paint. Roll it on and you are done. Except for cleaning up your mess. That's always the worst part! 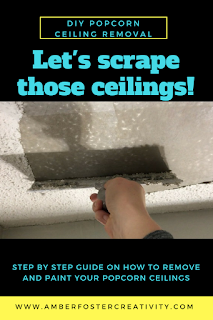 Nice blog great tips to remove popcorn ceilings. Is it any process to do this task in a short time.